Every year in the United States there are thousands of scaffold-related injuries and roughly 40 scaffold-related deaths. Understanding how to work on scaffolds safely can be crucial step towards saving a life. 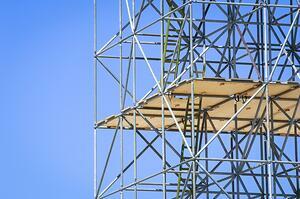 Let us dive into some important scaffolding safety tips for workers as provided by OSHA. Understanding the different roles of a competent person and a qualified person is important within any industry. When working with scaffolds, a competent person must have the ability to train and direct workers who are working on constructing or moving scaffolds. They must inspect the scaffold before each shift and after any event that might have affected the structural integrity of the scaffold. A competent person must also identify unsafe conditions and have stop work authority in order to maintain a safe workplace. Whereas a qualified person has the specific knowledge and training to design the scaffold and its proper rigging. Each supported scaffold must have its components must support a minimum of four times the intended load. This includes all personnel and materials that will be placed on the scaffold. The working decks/platforms must be 18 inches wide and close to the guardrails. The planks must overlap on a support by at least 6 inches and not exceed 12 inches. All metal components are checked for cracks, holes, bends, rust, pits, broken welds, welding splatter and non-compatible parts. All floor openings are covered, secured and labeled. Safe access to the scaffold is provided; i.e. ladders, ramps, walkways, and stair towers. Suspended scaffolds are required to be made of materials that are not easily dislocated; the counterweight must be able to resist at least four times the tipping moment. Be sure that on a suspended scaffold each rope supports six times the intended load. On a supported scaffold: the use of a guardrail or personal fall arrest system. On a single-point or two-point suspended scaffold: both the use of a guardrail and personal fall arrest system. On an aerial lift: solely the use of a personal fall arrest system. Each worker’s lifeline must be tied back to a structural anchor that is capable of withstanding 5,000 lbs of dead weight. Workers must also wear hard hats and ensure debris nets, toe-boards and screens are in place to stop objects from falling. Hazard recognition associated with the specific type of scaffold they are working on. The proper fall protection systems that must be in place. By following these regulations, workers can be sure they will go home safely. For more information on effective safety training for scaffolds or any other safety related topic, download our free safety manager’s guide to effective safety training.